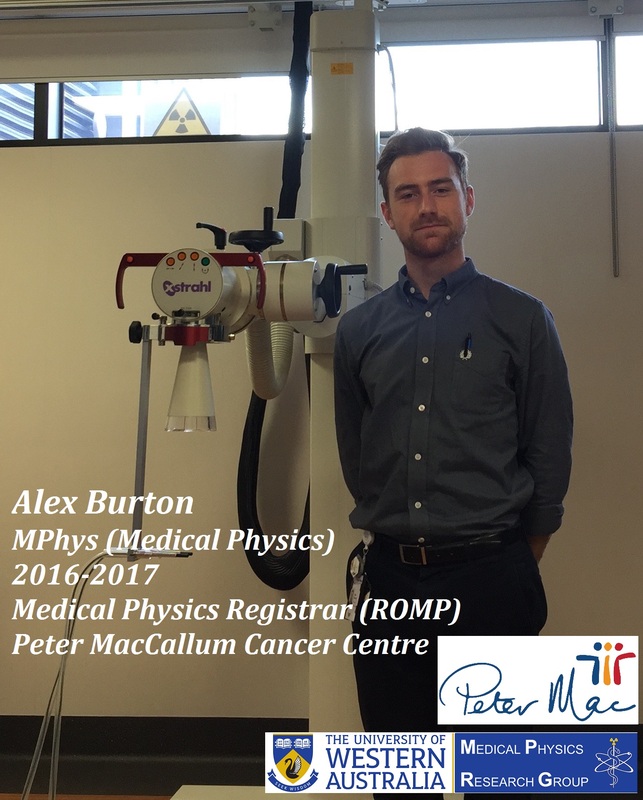 This post is about Alex Burton, who has recently finished his Masters in Medical Physics at UWA. “Alex was one of our most talented and extremely hard working postgraduate students. He had real interest in medical physics which was reflected in his excellent exam marks (all HD). Alex had a creative mind, and was a highly organized, self-motivated, and active student with impressive attention to details in answering assignment questions. His reports were always submitted on time and he did really well in his research project. For all of these reasons he got a very competitive position as a radiation oncology medical physics registrar at Peter MacCallum Cancer Centre in Melbourne when he had another semester to finish.” Pejman Rowshanfarzad, the Medical Physics Program Chair said. We had a clinical radiation oncology project in mind that would attempt to improve the efficiency and consistency of the planning process by comparing the geometric relationship of tumour and healthy tissues in a given patient with respect to database of previous patient plans. The project required knowledge of the radiotherapy planning problem, hands on use of the treatment planning system, manipulation of DICOM image, dose and structure objects, and coding development in Matlab. Much of the project design was left to Alex to develop, and he did an excellent job of managing the scope, researching the topic and formulating a project plan. I thoroughly enjoyed working with Alex and seeing first-hand how the project came along. I am sure he will have success in whatever endeavours he applies himself to in the future. “Alex made life very difficult for himself by undertaking employment whilst doing his Masters in Medical Physics – but he excelled at both and emerged with both the appropriate qualifications and experience to go straight into a physics registrar position. Alex’s project was quite unique and saw him combining international open-access data sets with data for current clinical patients in an effort to improve the quality of treatments patients receive. Alex seemed to really enjoy his project and was meticulous in designing the methodology and ensuring that his results were accurate and that they would have a real impact on the patient treatment process. I wish him every success and know he will excel in his chosen career field”. I’m Alex, I finished my Master of Medical Physics at UWA in November 2017. I’m from Perth, but I recently moved to Melbourne to take up a radiation oncology medical physics (ROMP) registrar position at the Peter MacCallum Cancer Centre, based at Sunshine Hospital. A registrar is kind of like a trainee – I am enrolled in the ACPSEM’s Teaching and Education Program (TEAP), which is a formal training program designed to produce ROMP specialists who know everything there is to know about clinical medical physics in radiation oncology. TEAP covers everything from the physics of cancer treatment with radiation, to the management and maintenance of all the encompassing apparatus. It is my responsibility to ensure that I am on track to complete the training, as well as be up to speed with the local clinical practices and be a useful member of the team. There was plenty to enjoy about studying at UWA and being part of the MPRG. The best part was the team atmosphere that is fostered by Pejman and Martin, and the sense of collaboration and community that exists in the MPRG. Medical physics is a unique field in the sense that the pure science is so closely linked to real life outcomes that form an important part of the patient journey – be it in radiation oncology, diagnostic imaging or nuclear medicine. It is really great to work in an environment so entrenched in both science and practicality. Medical physics is actually quite a broad field that is constantly evolving. As an academic pursuit this makes medical physics quite exciting, as there is always novel research to be conducted, and plenty of opportunity to gain highly specialised knowledge. Medical physics is a true test of your ability to think critically on-the-go. If you enjoy performing experiments and applied science, then you will enjoy studying (and working in) medical physics. My field of research is treatment planning quality assurance modelling, which is fairly recent in its development. I feel as though the most novel part of my project was the level of detail in which the factors affecting the model’s performance were examined, in particular, the model’s sensitivity to the data that is fed into. The experimental design for this part of the project is perhaps the thing that I am most proud of. Medical physics may seem like a bit of a mysterious industry. Do not be afraid to approach anyone you know who is involved to find out more about what it is exactly that medical physicists do, and what you could be involved in should you choose this study or career pathway. The variety of answers will surprise you, but hopefully you’ll be able to find something that you are passionate about, which is essential in order to successfully pursue medical physics. Abstract: Treatment planning quality assurance (QA) models attempt to predict the best achievable dose-volume characteristics for a prospective or retrospective patient based on geometric assessment and comparison to a dataset of prior patients (training cohort). The issue with many planning QA models in the past has been that they are developed on the same set of plans they are designed to assess, making it impossible to distinguish the model’s predictive efficacy from inconsistencies in planning priorities arising from differences in clinician skill and experience. The Erasmus Cancer Institute’s iCycle algorithm has been used to develop a dataset of 115 Pareto-optimal prostate VMAT treatment plans on a fixed set of planning priorities, representing a gold standard dataset for the purpose of developing a planning QA model. In this project, the Erasmus dataset was used to develop an overlap volume histogram (OVH)-based planning QA model, based on the model described by Wang et al. (2016), and the limits of its accuracy were determined. This talk will outline the predictive model which forms the basis of the planning QA model, and discuss in detail two methods of querying the prior patient database which were investigated in order to determine the model’s sensitivity to the size and makeup of the training cohort. The performance of a similarity index (SI)-based model (which allocates only the most geometrically compatible patients to the training cohort) was compared to the standard model (in which all of the available prior patients are used in the training cohort) on a set of performance metrics designed to be both clinically relevant and useful in determining the model’s accuracy. In the final part of the project, the SI-based model was implemented to retrospectively assess a dataset of 60 patient treatment plans from Genesis Cancer Care WA (GCCWA), in order to gain an idea of the model’s clinical viability. We wish you best of luck Alex in your future roles. You will be an excellent clinical medical physicist.